Why do people behave as they do? 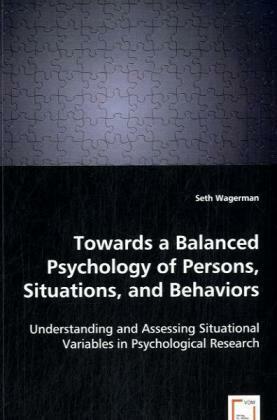 It is widely accepted within psychology that behavior is a function of both the person and the situation, but while there are numerous ways to assess a person, the development of variables and instruments for characterizing situations is barely begun. Toward this goal, a tool for the assessment of the psychological properties of situations is introduced: the Riverside Situational Q-sort (RSQ). It is built around two general principles: first, that situations should be studied at a midlevel of analysis; second, that people and situations must be conceptually separable if they are ever to be used as independent explanations of behavior. §This book explores a number of questions regarding how situations affect social behavior: do men and women view aspects of situations differently than one another? What properties of situations engender happiness, sadness, or anger? What personality traits are related to the way we perceive our situations? What do people do in the situations they encounter? And perhaps most importantly, what happens when one views a situation in a markedly different manner than the rest of the population?